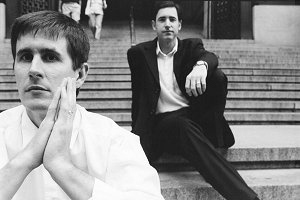 The Mountain Goats are not only currently on their first band tour of Europe in more than six years, they have also released what might as well be the first essential album of the year 2003. Tallahassee is a huge step forward for John Darnielle and his gang, as it's the first album recorded entirely at a professional studio (Tarbox Road, with Tony Doogan producing) and the first on well-known british label 4AD. Some might miss the charm of the cassette-only boombox experiments of the earlier Mountain Goats recordings, but if you like anything between Nick Drake and Neutral Milk Hotel, Tallahassee is an album you can't afford to miss. John Darnielle was kind enough to answer some of our questions. John: "I feel like I'm about to get to the sweet center of things: don't know if this is clear. But I've been writing songs for some time now and I feel like I've gotten past some of my older, weaker points (overromanticizing things, substituting my own voice for that of my characters) and gained the ability to do what I've always wanted to do (sketch accurate & believable pictures of situations, let my characters speak for themselves). For me it's always about the writing and the singing -- musical trends don't have a whole lot of effect on what I do." LK: Was using a well-known studio and producer sort of the masterplan behind the album from the start, or did the deal with 4AD just meant you had a bigger budget that you could put to work? John: "I thought that after All Hail West Texas, my first all-home-recorded album since Zopilote Machine, it was time to try new things. So when I thought about that, I thought: "if I went into a big studio, what kind of songs would I want to sing?" And immediately it was like the Alpha couple, these two people who used to haunt my songs a few years back, were there, sort of jumping up and down and saying: "We're still here! Hello hello!" And I wanted to give them a kind of dignified place in which to drink & fight & try to learn to love each other right." LK: Did you set yourself different goals than usual? John: "I usually don't work with goals - maybe small goals, like "here's a song with a mean title, let's try to make the song a mean cruel thing too" but nothing more ambitious than that." LK: What do you find inspiring these days? John: "It's always new records and books! And also horror movies, which I watched while writing Tallahassee: Dario Argento movies & documentaries about women serving life sentences in prison. Also I take inspiration from biographies of people - recently Bruckner for example. There is something so sad in the way he always revised, revised, revised his works in the hopes that they'd be received well by the rich Austrian society-people - Bruckner himself coming from a poorer background. The melancholy mood of real life stories like that one tends to put me in a songwriting mood." LK: Do you feel a different kind of (for a lack of a better word) "responsibility" for your band and music now that your records are widely available through 4AD? Is your approach the same regardless if it's an album on an established label like 4AD or a limited edition of 300 vinyl only single? John: "Oh, I feel the same responsibility if it's an edition of 25 or 25,000 - my obligation is to my listeners, whether there are lots of them or only a few. I know this sounds very cliché but I mean it - I am thankful in my heart that people take the time to hear my songs and so I always do my best to write songs that will somehow reward my listeners. Sometimes that means writing songs that may confound them (like the very obscure 3" CD On Juhu Beach) but I put the same amount of work into a tiny release as I do into a big one." LK: Do you notice a shift in the dynamics within the band with every new record/"phase" or are the roles within the group pretty much set by now? LK: You obviously like concept records a lot - most people would probably think it's harder to work within a conceptual framework - is that different for you or do you just like the challenge? John: "Working with bigger concepts gives me more freedom - the characters get more complicated & do more exciting things, and surprise me sometimes, and I get really emotional about them. I don't know that big-concept versus "normal" songs (single miniature song-events) is really a harder vs. easier thing though: just different. I really enjoy putting flesh onto my characters' bones and for me the best way to do that is by giving them a number of songs to live in." LK: Do you still work quite fast these days or does it take you hours and days to figure out what you want to do with a song and how it will fit into the bigger concept? John: "Both! Some songs take me a long time to write, especially when the lyric structure is a somewhat complicated one ("Oceanographer's Choice" for example took me all day), others just invade my body like a fever. But the germ of the song usually comes the same way it always has: in a quick, quiet second, not a flash of inspiration but a sort of mute half-second where I get an image that seems to hold more than it's telling me. And I write down the image (or the phrase, or place-name) and it starts to unwrap itself." LK: As far as the "Alpha couple" [two characters that often pop up on Mountain Goats records] is concerned - did you intent that they would become recurring characters all along or is that something that just took a life of it's own? John: "They kind of barge into my head from time to time - when I first started writing about them it was for a very specifically limited series of poems but once they got into the songs they got harder to control. I love it when characters sort of start gate-crashing their way into my songs, though, it's hilarious to be working on a song and then suddenly say to myself "Wait a minute...whose song is this? Oh Christ it's those awful Alpha people again, I hope they haven't gone and hurt anybody yet." LK: As I'm sure that for quite a few of our readers Tallahassee will be the first Mountain Goats album they get to hear. So which of your previous records would you consider a good "starting point" for someone wanting to seek out more stuff by TMG? John: "I'd say The Coroner's Gambit might be a safe after-Tallahassee choice: it's part small studio, part home-recording. But I'm really quite partial to All Hail West Texas, which is very very raw, all home-recordings. I guess it depends on what they'd liked about Tallahassee - if the love story & the hard drinking, then All Hail West Texas is the way to go. The Coroner's Gambit is an album about death and so if somebody wanted the darker stuff that'd be where they could get it." LK: Was there a turning point, where you realised that this band would probably last longer/be bigger than you would've ever imagined? And do you think of the band as "a career" now more than before? John: "I try not to think about "career" any more than I absolutely have to; I like to focus as much as I can just on the songs, and on singing the songs, and on getting to know the people who like the songs. I do remember playing a show in Berlin once and thinking "I want to keep singing until I grow old and die, I want to sing forever" and after the show thinking that writing & singing songs wasn't a phase but something I was into for the long run." LK: Do you plan to make your upcoming concerts a "concept" show to tie in with the album? I'm told you have over 300 songs, so there's obviously a lot of material to chose from? How dod you come up with a setlist? John: "I plot the setlists well in advance of leaving on tour - I get out my records and listen to them and see which songs work for me, and Peter and I talk about what we want to play. But then usually I am most excited about the brand-new songs, the ones nobody's heard yet. "Concept" show? Well, we play stuff from more or less all the albums; most sets have a sort of loose narrative motion to them but we're not just going to play the new album - we haven't been to Europe together since '96 and there've been several songs I've been dying to play for old friends out there for a long time." LK: I guess the 4AD graphics dept. is responsible for the lovely cover artwork - how important is the packaging to you and much much input did yopu have this time around? John: "Packaging's really important to me but since v23 is such a great designer I just told 'em to do what they liked. We talked about what mood to strike & what sorts of images I had in mind, and then they e-mailed me the images and I was completely blown away. Vaughan Oliver and Chris Bigg, who did the cover, are such great visionary people - I can't even describe how totally ecstatic I was when I first saw the whole cover-package." LK: Last question - would you be willing and able to recommed five underrated records, or maybe five records that played a crucial role in making Tallahassee? John: "Lifter Puller's Fiestas and Fiascos; The Stockholm Monsters' Alma Mater; Jean-Luc Guillonet's Axene; Kataklysm's Epic: the Poetry of War; the complete recorded works of Frankie Valli and the Four Seasons... People always think I'm trying to be funny by liking such different kinds of music but I'm not." You may also want to check out our Mountain Goats articles/reviews: - another interview with John Darnielle, Tallahasse, The Life Of The World To Come.